I like eating. Good stuff. I don't want to eat just to fill my belly. I want to eat stuff that my mouth enjoys. I like to cook. Good stuff. Stuff I know my mouth will enjoy. I don't like following instructions. I consider recipes my inspiration. I don't measure. I just go with my gut. Sometimes I get stuck in ruts with my cooking. I have trouble coming up with enjoyable food to cook. Then I regress. I don't want to cook and just want to go out to eat. Sure that is fun sometimes. But I like making scrumptious, home cooked meals I can be proud of. This week has been a good cooking week for me. Full of inspiration, cooking and good food. One of my obsessions lately has been caprese. I will find any reason to make it. 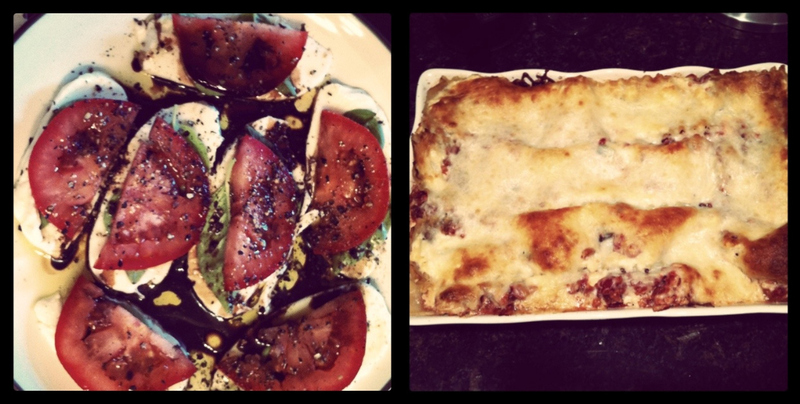 Last night I made lasagna, so of course I made caprese too. It was all good. So good. You can't go wrong with caprese. And the lasagna, it keeps getting better every time I make it. Sure, there will be changes for next time. But anything with baked cheese, garlic and basil is good. Good for the mouth, good for the belly. I'm feeling inspired and ready to cook again. And I'm feeling hungry! I love caprese. Mmmm... I have NOT had enough garlic, basil and cheese lately.